I have been enjoying reading your blogs, and following Anne as she reaches new fitness heights. Starting last winter, I realized that I missed blogging. So I'm doing it again, not really more than a post or two a week, but it's fun. My clothing choices have been, uh, limited lately, so there's not as much as style as in the past. But there is cooking, DIY, and other developments, so pop on by if you're interested. King Gustav Aldoph says "Why not check out Rad's new blog?" Hey Style Nation, what's up with you? 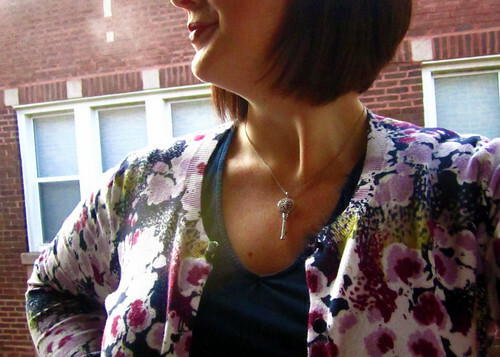 Since I stopped style blogging regularly, I've been busy! The main things are that Fella and I are planning to get married this year, and I've lost 23 pounds. Totally unrelated, I swear. 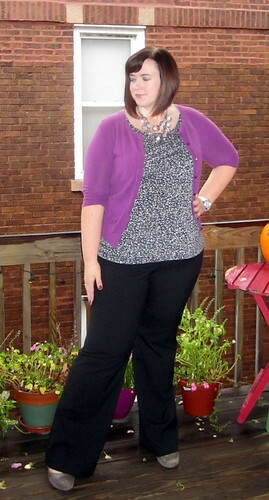 In any event, I'm still blogging over at my own blog, and I've decided to start doing the occasional outfit post again. The pictures below are a shameless ploy to entice you to visit my new space, since I just posted my first outfit post there today. Since Rad's mostly out of the blogging game for now, I'm going to keep things up at my blog rather than here. Is the red rectangle too matchy-matchy with the brick wall? I'm sure I'm taunting the weather gods with this next statement, and we'll get a blizzard any day now, but I'll say it anyway - we've had an incredibly mild winter here in Chicago. It's snowed twice, and both times has melted within a couple of days, making way for warmer (like, 40 degrees! ), sunny days. As a result, I haven't really had to dress for bitter cold winter weather just yet. My warm, lined dress pants are still packed away in my closet, because I've been able to get away with skirts and dresses. 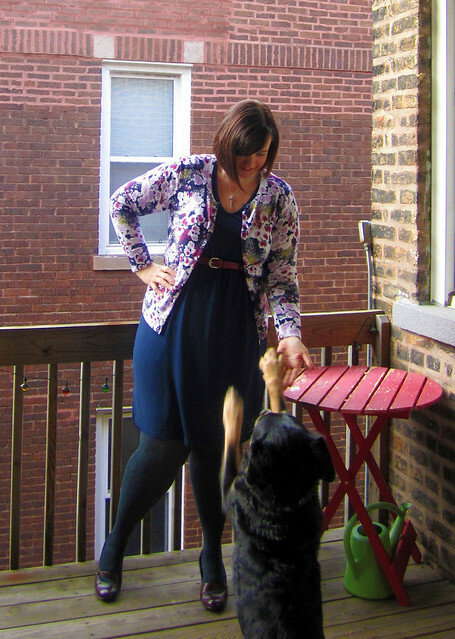 And in wearing dresses all the time, I've settled into a really easy, though perhaps boring, formula of dress + belt + cardigan. It's hard to mess with success. So here's a couple of those. Yay! I remembered how to take outfit photos! Happy 2012, Style Nation! How were your holidays? And how is your new year shaping up? I meant to pop in much sooner than this, but I just haven't been able to find the time (which is a shame since I have managed to snap a few outfit photos). And with the busy holiday season last month, I was only actually in my office about 10 times, so I didn't have a ton of outfits to showcase anyway. If you've been reading my blog, you might know that my focus has shifted away from style and onto my own personal health and fitness journey. While many people have resolved to be healthier starting on New Year's, I made that decision toward the end of November. Along with getting healthier, I set a goal of losing 60 pounds with no end date, and thus far I'm down 7. I started working with a personal trainer at my gym in early December, so exercise and healthy eating has taken up most of my time. I assume that the further along I get in this, the easier it will be and, thus, the less time I'll have to spend thinking about it, making my weekly gym schedule, logging my food, planning meals, finding new recipes, etc. Then I might be able to make a return to TCC, since I do miss style blogging. In the meantime, I am reading your blogs, even if I don't always get a chance to comment. Keep on looking great, Style Nation! 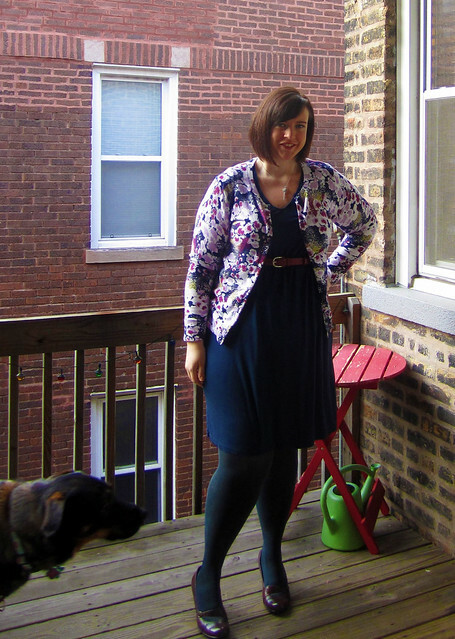 And look, I've totally forgotten how to take a proper outfit photo after just a week off from style blogging! Just as I thought I had everything all figured out, I spotted this dress at Loft. It was half off, and with my $20 "rewards coupon" (which means I spend WAY too much of my money at Loft), it ended up being $20. Stylenation, you know I can't pass up a good deal. I love the cute lace yolk styling on the neckline and the elastic waist that was just begging to be belted. And I thought that being 2 neutrals that are already pretty heavily represented in my wardrobe, it'd be easy to work into my rotation. The problem is the high neckline. 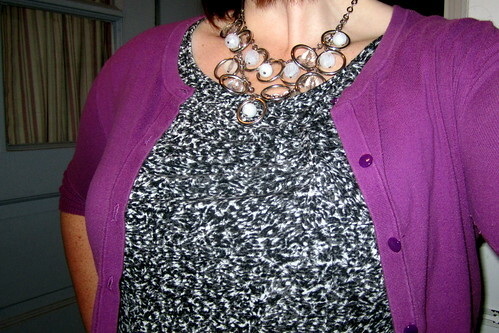 I ended up pairing it with a black boyfriend cardigan that would accommodate the shape of the neckline. But that's the best I could do. And you know I need some more color than this. How would you style this dress? Hello Style Nation. After Anne's very sweet "stepping back" post, I thought I'd say a few words before I sign off the style blogging world for now. Since I last posted many moons ago, I feel that my priorities have shifted towards new things. I still really love style and I read many blogs still (although my ability to comment has gone). But after some good long talks with the Blokey, accompanied by some money related goals, I've decided to basically stop buying clothes as much as possible, and not blogging helps a lot with that. 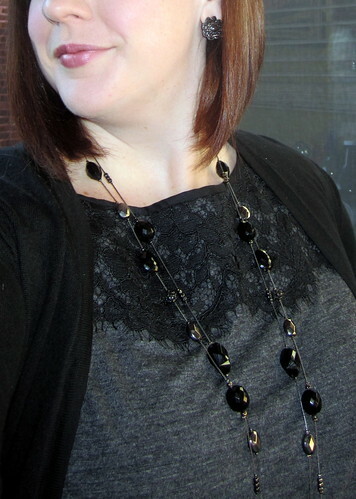 I pretty much wear black, grey, and other neutrals all the time. Hopefully still in a stylish way. 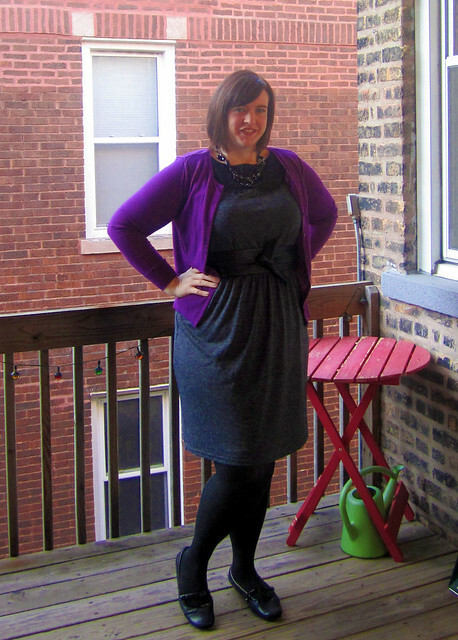 One of my grad students, who is a self-declared shopaholic, told me yesterday that I "dressed well." (I was flattered. The other students made fun of him). But in addition, I've had lots of new, exciting things that I've been involved with. Surely you didn't think someone who calls themselves "Rad" would sit on the sidelines during Occupy Wall Street? This requires multiple, 3 hour (sometimes longer!) "participatory democracy" based meetings every week, in which everything is discussed, at length. (Did you see the video with Ketchup on Colbert Report? The hand signals are about right). In addition to my participation in a couple working groups, I've also recently become an "irregular correspondent" on a Chicago-based community radio program, This is Hell. Well, it's not official yet, but I agreed to it on air last weekend. This is all on top of this my usual teaching/research/service, as well as a running regimen. Lastly, Steven and I are in the midst of a key marital dispute over whether to get a dog (I say yes; he tries not to roll his eyes). Hope all is well and I will continue to follow your blogs on Googlereader. I do not have plans for any additional blogs, but perhaps I'll have a political one in the future. In the meantime, happy November to all! If anyone comes to NYC, I'd love to meet up for some herbal tea (which is in the cup above) and many some Caribbean food. I don't know how to say this aside from just coming out and saying it - I'm going to be stepping back a bit from this blog right now. It's not that I don't like sharing my office style with you all, but I just don't feel like I have a lot to actually write about here. Sartorially, I've gotten myself into a pretty good groove. Some may call it a rut, but what I've come to realize is that it's just my own personal style. I've found it, and since it's pretty consistent, there's less posts where I'm experimenting with new looks or seeking advice on how to wear things. I'm just happy and comfortable with the way I'm dressing, which is a pretty good place to reach. 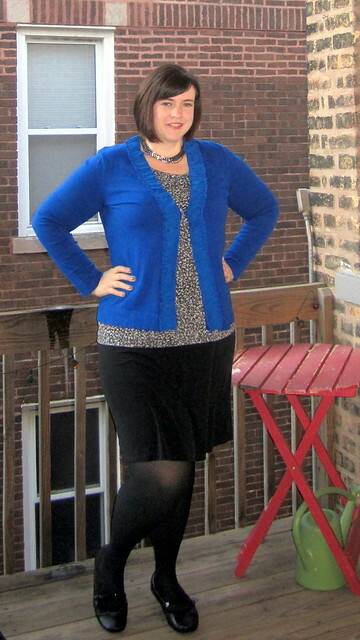 Now I have outfit photos just sitting on my desktop, waiting to be posted because I don't have much to say about them. I'll still be posting outfits, but probably not as often. Meanwhile, if you need your fill of me in the blogosphere, you're welcome to check out my photo blog, where I'm currently about halfway through my own 365 project. And because I really enjoy writing and clearly needed another blog, I recently started up a personal blog. So there you have it. 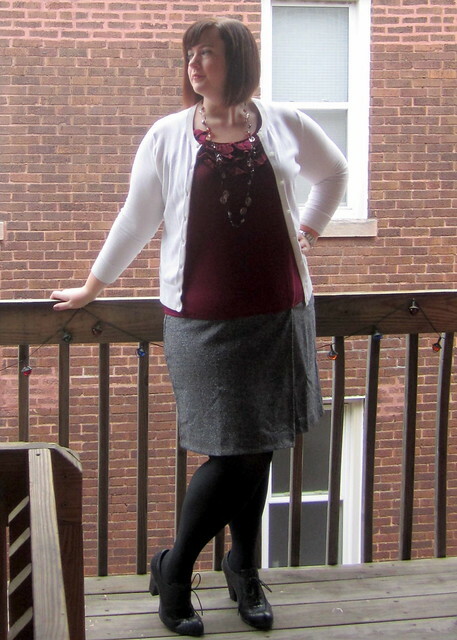 Here, we show off our outfits or our style dilemmas. Sometimes, cute animals and weird political stuff too.